The Darkness in Dreams is a paranormal shifter romance novel written by Sue Wilder. The Calata had met to discuss the actions of one of their own, known as Six. His enforcer had begun killing the girls, something not to be permitted. Kace had already disposed of three girls, using a meditation program he insinuated onto their phones, which began the process of restoring their memories of their past lives. Along with those memories came dark dreams that were horrific and unrelated to their pasts. Kace had already begun the process with Lexi, an independent young woman who was making her way by reading the earth for New Agers. Kace had contracted her under the guise of Wallace, a prospective client from Montana, and had successfully installed his app. Lexi was under the Calata known as Three’s protection, as was Three’s own enforcer, the most powerful of all enforcers, Christian. He had disappeared into the Void for hundreds of years and attempts to lure him out again had been unsuccessful. The Calata knew he had to be summoned to address this threat before Lexi and more girls went missing. 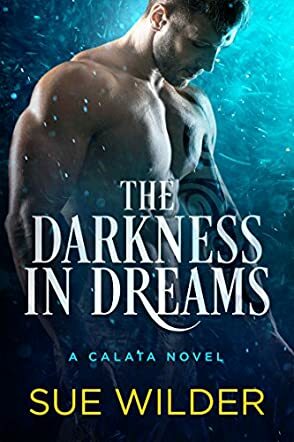 Sue Wilder’s paranormal shifter romance novel, The Darkness in Dreams, is an enthralling tale about a godlike cabal of beings, the enforcers they created to enforce their territorial rights, and those human women who became their beloveds. Wilder posits an interesting correlation between the immortal enforcers and their human mates who are reborn with their memories buried deeply within their consciousness. Lexi and her therapist, Marge, are two such reincarnated mates, but here the similarity ends as Marge’s Robby is quite a different proposition than Lexi’s Christian, whose service to Three meant endless desertions of his human mate throughout her past lives. Will the two ever be able to get past their history of betrayals and disappointments? Will Christan be able to keep the independent Lexi safely out of the hands of Kace and stop his predation of the girls? Wilder’s story is fast-paced, and her shifter-enforcers are grand fun to watch. The Darkness in Dreams is highly recommended.